The last craft fair for 2010 is done . . . a nice day at T.C. Williams High School in Alexandria, VA. It has been a busy year: 17 craft fairs. All told, I had 202 sales involving 394 items. That's a fair amount of clay. Thank you very much to those who purchased an item from me. Even after selling my pottery for three years now, I am still humbled when someone selects one of my items to buy. A short holiday break -- then on to planning for 2011. I started to make a "wavy" tray late in the year; I see those becoming a staple for 2011. I also want to explore some new shapes and forms both on the wheel and in handbuilding. 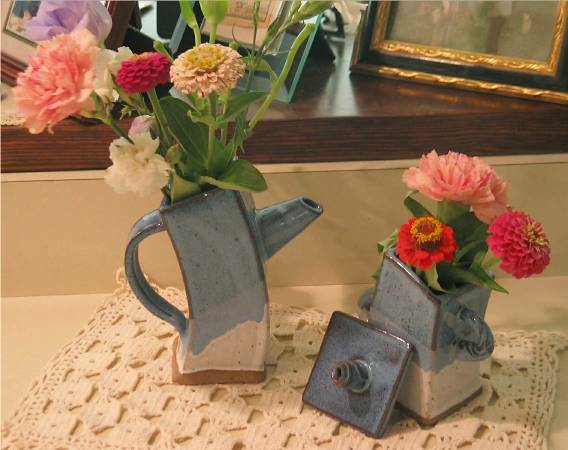 I've always wondered what people who buy my pottery actually use it for. So, I was pleased when a customer sent me this photo of an extruded teapot and bowl that are being used for vases. Even better is the name she gave the photo. Thanks Karen. Here are some of the pots textured with the "Steve Tool" that have come out of glaze firing. In between shovelling episodes, managed to create some new platters/trays. Tried earlier to do some wheel throwing, but the garage temperatures were too cold and my fingers just did not cooperate. So, back to slabs. Clay is Standard 266. With more snow in the forecast, maybe a few more platters. Virginia is for . . . Shovellers!!! Here are some pix from the storm they are calling "Snowmaggeddon". We had about two feet. . . problem is you quickly run out of places to pile the snow. We shovelled four times -- once Friday, twice Saturday, and this morning -- to keep up with the storm. The thought of trying to shovel two feet or more of snow after the storm was over was more than I wanted to tackle. Chalk it up to lessons from childhood days in Wisconsin. The snow was wet and heavy and I'm afraid the trees and shrubs took the brunt of the storm. We'll have to see what damage occured, but I've already seen some snapped and broken limbs. Overall, we were fortunate . . . no loss of power, plenty of food and warmth, and the street has already been plowed!!! A few more pots textured with the "Steve Tool". I added a colored slip (porcelein claybody and water run through the blender until smooth and creamy, then Mason stains added) to the thrown cylinder before applying the "Steve Tool". I'll glaze these in clear. The bisque-ware is building up, need to move on to glazing. "Steve" pots are coming . . . I've been working with the "Steve Tool" to make textured pots. Here are a couple of pictures of pots through the bisque firing process; the bottom photo is two pots sitting on top of each other. A few more are at the studio (Creative Clay) in the bisque kiln; others are on the shelf drying. For some of hte later pots, I used a colored porcelein slip to create bands that were then textured. These will be glazed and fired in an electric kiln, ^6. I also plan to make some for firing at ^10 -- either gas reduction or salt firing. Hopefully I've not jinxed these pots by showing them before they are done. My first pottery instructor told us not to fall in love with a pot until after it is glazed and fired -- very good advice. The "Steve Tool" is made by Steve Graber. It is really fun to play with and create interesting surfaces. I have one of the "originals" with the texture gears made of wood. The claybody is Highwater Little Loafers. Here are photos of some recent work . . . things have been a bit slow lately, mostly due to the kitchen renovation crew taking over my workspace in the garage for most of November and December. The kitchen is now completed and I've regained space to work and fire.